Then I have met you within the range of simple motion of temporary moment. Its just me who didn’t know how to share that precious moment in a good term & manner, since my ignorance of a complete fool & egoistic soul made me blind & deaf. 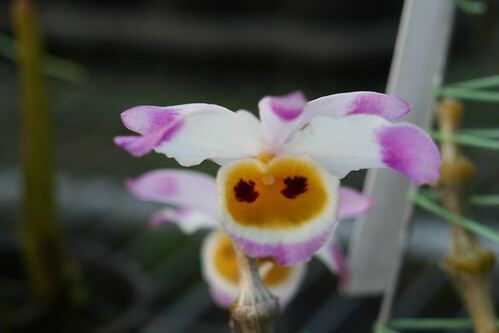 I know you love orchids so much, and your smiling face just so charming as those orchids when you looked at them. I was a man without a dream, and your happy gestures every time you were talking about orchids made me realized how was dream can be so beautiful. I knew somewhere in the past I did promise you to help making a beautiful plantation of orchids in your home garden (or ours?). But I’m very sorry, I have ruined everything to the very root of those dreams. I really love to fulfilling our promises, but again, without any words more – I am truly sorry. But thanks, for letting me know about the dreams that you love from the bottom of your heart. p.s: to ucky, please let me stole your charming picture for this post 🙂 – since this for someone so important for me. artiin dulu akh *ambil kamus*….